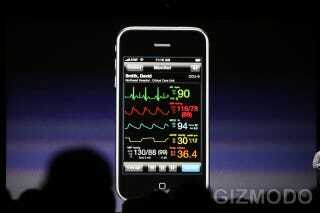 We saw a parade of developers showing off fancy new iPhone 3.0 apps on stage today. Lets take a look at what was unveiled, shall we? TomTom Turn-by-Turn Directions—Not only did TomTom announce an app for turn-by-turn directions, but they also announced an accessory for the iPhone that sticks to your windshield. It's got a speaker and mic built in for the voice to tell you directions and you to talk to it to ask for directions while also enhancing the GPS signal. Coming this summer. ScrollMotion's Iceberg Book Store—This is a Kindle competitor that'll offer over 1,000,000 books for download at launch, including textbooks by Houton Mifflin, Harcourt and McGraw Hill, as well as 50 magazines and 170 daily newspapers. AirStrip—Get excited, doctors! This app lets you stream a patients EKG over 3G, which is downright nuts. You can also zoom in and replay "cardiac events," which are the kind of events you never want to have. Star Defense—From ngmoco, it's a tower defense game that looks a lot like Super Mario Galaxy. It's available right now for $5.99. Here's Kotaku's review of it. Pasco—This is an app for doing science experiments. ZipCar—The ZipCar app lets you find nearby ZipCar lots, see what cars are available there and make reservations. Even cooler? Once you book your car, you can unlock it using your iPhone. Pretty awesome. More at Jalopnik. Line 6—This app lets you plug in your guitar and change its sound as if it was plugged into different amps. You can make an electric sound acoustic, design your own guitar based on pickups, pickup configuration, body type and other factors, or make it sound tuned all on the iPhone.